The best offensive linemen typically don’t become available, but there are more than a handful of probable unrestricted free agents who could intrigue the Vikings. Improvements to the Vikings offensive line will be first attempted when free agency opens March 13. The best typically don’t become available, but there are more than a handful of players set to become unrestricted free agents who could intrigue the Vikings. Nothing may be excluded in the overhaul, where guards Nick Easton and Tom Compton are free agents. Guard Mike Remmers is coming off a down season with an expendable contract. They could be in the market for a tackle or at least tackle depth, having discussed moving left tackle Riley Reiff to the interior. Paradis, 29, is recovering from a fractured fibula in November, but he was one of the NFL’s best centers last season before his injury. Gary Kubiak knows him well. Paradis started 35 games in 2015-16 while Kubiak was the Broncos head coach, including all 19 games during Denver’s Super Bowl season. Keep in mind center Pat Elflein was a standout right guard at Ohio State, where he was a two-time All-Big Ten selection before becoming the nation’s top center as a senior. A key cog to the Rams’ powerhouse offense, Saffold had a great encore to his 2017 second-team All-Pro season. But the longest-tenured player in the Rams organization could return on a new contract before hitting the open market. 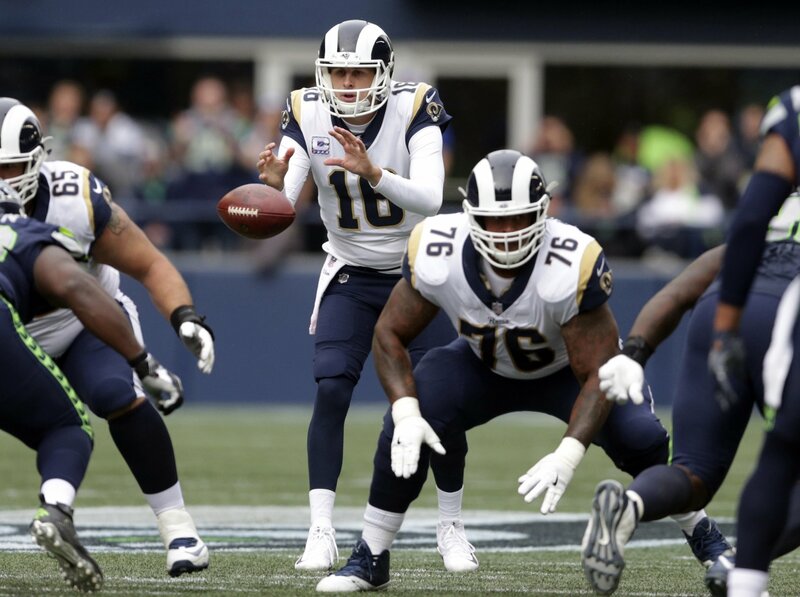 What could separate the two is potentially Saffold’s final, big-time payday. He turns 31 in June after another strong season as the ninth highest-paid guard based on last year’s $7.951 million salary cap hit. Foster has been a constant at left guard for the Steelers, an offense that has surrendered an average of 21 sacks in each of the past four seasons. Kirk Cousins took 40 sacks last fall and would benefit from having a veteran pass protector like Foster up front. Foster did just turn 33 years old, so he could drop off soon. Spain is interesting in that he turns 28 in August and has played well in the NFL, despite his recent struggles in Tennessee. He could be had at the right price for a Vikings offense looking to rebuild its line with new talent. Since going undrafted, Spain has started 50 games as the Titans left guard in four seasons. Carpenter, who turns 30 in March, has started 102 games, including both of Seattle’s recent Super Bowls. More noteworthy is he started 10 games at left guard last year for the New York Jets and offensive line coach Rick Dennison, who was recently hired to the same post in Minnesota. He is coming off a shoulder injury that prematurely ended his season, but could bring veteran competition. Miller, a former third-round pick, is another player with history under Dennison. That history wasn’t all good. Miller was benched after four games at right guard under Dennison’s Bills two years ago. But Miller rebounded last fall with a better 15 starts that could make him a potential target. The Louisville product turns 26 in June. Brown, who turns 26 in April, figures to be sought after if the Patriots let him test free agency. He was a draft-day trade from San Francisco to New England, where he started 19 games and won a Super Bowl ring in the final year of his rookie contract. Brown was the 49ers right tackle before the Patriots moved him to protect Tom Brady’s blindside. Mills, 28, has been a starter for six seasons at right tackle between his time in Chicago and Buffalo. That includes a full season for Dennison’s Bills in 2017, so there’s familiarity there. If the Vikings opt to move Brian O’Neill to the left side, Mills could be a replacement on the right side. Sambrailo, who turns 27 in March, was a second-round pick by Gary Kubiak’s Broncos in 2015. His NFL career hasn’t ascended after his three-game rookie stint at left tackle ended on injured reserve. He’s started two to four games each of the last three seasons, including at right tackle and left guard for the Falcons. Sambrailo played for Colorado State, which is Vikings quarterback coach Klint Kubiak’s alma mater. Could be a depth target. Nsekhe, 33, has been a standout replacement for Washington, including 11 spot starts in front of Kirk Cousins. He’s versatile, proving so again last season with starts at left tackle and left guard. Deadlines, key dates, NFL Combine: What's ahead for the Vikings?